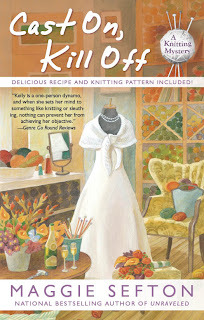 Killer Characters: That Woman Is At It Again. . .Invading Our Privacy! That Woman Is At It Again. . .Invading Our Privacy! Can you believe it? That woman who hangs around Lambspun knitting shop---spying on everyone, scribbling and taking notes---has written another book about us! She left a copy of it on top of the library table the other day. . .accidentally, of course. CAST ON, KILL OFF is the title, and, would you believe it's the tenth book she's written about us! Talk about eavesdropping on people. I had NO idea she'd written that many books about us. That is seriously scary, guys. I need to check with Burt and see if she's broken any laws, you know. . .like privacy or something. Hmmmmmmm. I'll look into that. Meanwhile, she left a note with this description she wanted me to post to you today. You make up your own mind. I often sense the presence of an unseen eavesdropper. But you know what? We characters haunt the lives of our authors, too. Heh heh. Oooh, a wedding and a murder?? Sounds like a FUN combination! Seems to know about murders before they happen. Scarey.